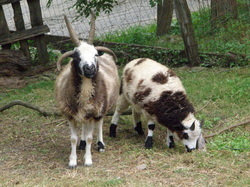 Painted Rock Farm is dedicated to preserving the Jacob Sheep! We do our best to work with every customer, large or small, to provide them with quality breeding stock. We offer lambs, young adults, proven flock members and, occasionally some older 'retired' sheep for the farm. Jacobs are perfect for your small homestead flock! NEW FOR 2019 - FINANCING IS AVAILABLE FOR INDIVIDUAL ANIMALS AND STARTER FLOCKS. TERMS AND CONDITIONS DO APPLY! YES! Please contact me about financing options! Check the Sale Pages often! We do our best to keep them updated but feel free to call or email with questions about availability of any animal. Please understand that we may deal with many inquiries about the same animal simultaneously. It is our policy to handle inquiries in order they are received, allowing our customers a reasonable amount of time to evaluate a sheep and make a decision (hence our term 'customary hold'). See "Common Terms" section listed below, right. Once you've made your selection, you will need to place a 50% deposit to hold your sheep. Typically, we prefer all sales be finalized within 30 days but are willing to coordinate schedules for delivery or pick-up beyond this time frame. WE NOW OFFER FINANCING FOR YOUR FLOCK OR INDIVIDUAL SHEEP! ASK FOR DETAILS! Every state has its own requirements for importing sheep and health certificates are mandatory for traveling across state lines. Certain states require blood testing, travel permits or the like. All fees associated with the veterinary health inspection, including tests,permits, etc. are the sole responsibility of the buyer. You can contact your State Department of Agriculture for details and questions about the importation requirements. We provide you with a copy of the health certificate, complete health history record, printed pedigree and registration application (or copy of certificate for sheep already registered). We gladly can assist you in the registration process for those lambs not quite old enough to be submitted. 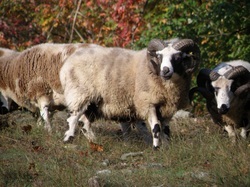 For registered animals, we pay the ownership transfer fee and send the paperwork to the Jacob sheep registry where its recorded then forwarded directly to you. If you are a local buyer or are going to be in our area, please consider scheduling a farm visit. We can set aside a few hours time to show you our flock and make arrangements to conduct hands-on inspections of available sheep. We keep pedigrees readily available and often have familial lines still within our core flock for viewing. Please note: we do NOT conduct public tours. Farm visits much be scheduled in advance at a mutually agreeable time. Lambing time is not generally ideal for farm visits as lack of sleep makes for one grumpy shepherdess! Traveling with animals can be stressful! We recommend getting your off-loading area ready BEFORE you bring your sheep home. This means getting your stalls or pens set up, bedding spread and water buckets filled ahead of their arrival. Once you get home, you can off load them right into their new environment and allow them some quiet time. Don't handle your sheep too often for those first 24 hours. Let them see you, hear your voice and be fed by you but give them time to adjust to their new surroundings before you have a welcome home party for the whole neighborhood. Sheep for Sale - click photo to check out our Sale Pages!